This is one of those projects that came together without any planning. I had just received some new dies (arms and hearts from AccuCut, the metal blade dies that cut five sheets of cardstock like butter)) and I had two stamped Crazy Birds with feather tails left over after making the batch of ‘You Got This’ cards for my tutorial a couple of weeks ago. Bingo! That old saying about a bird in the hand came to mind and before I knew it, I’d made some 6” x11” wall ornaments. Some of the hearts called out for a word or two. The birds needed dimensional eyes. The hands just HAD to have glitzy rings and the arms needed fancy bracelets. Now all I need to do is decide whether I’m willing to fold them for mailing or if I’m going to spring for a long envelope and pay the extra postage…or I might end up hand-delivering this batch to local friends. Want to get in on the action? I’d be delighted to bring the arm and heart dies to The Queen’s Ink for a mini workshop if anyone is interested. Please leave a comment here or call the store and the first five people who want to meet me for an hour or two on a weekend later this winter will be included. Here’s the deal: No class fee. I’m donating my time. But each person who attends must spend at least $20 on anything you want from the store shelves (not necessarily paper or cardstock – you can bring your own!). Everybody will take turns using the dies – you can cut as many arms and hearts as you want during the time block. I’ll also bring some of the stickers I used for the ‘jewelry’ to share. 1. Hand- or die-cut an 11” long arm with hand. Hand- or die-cut one or more hearts for each wall card. 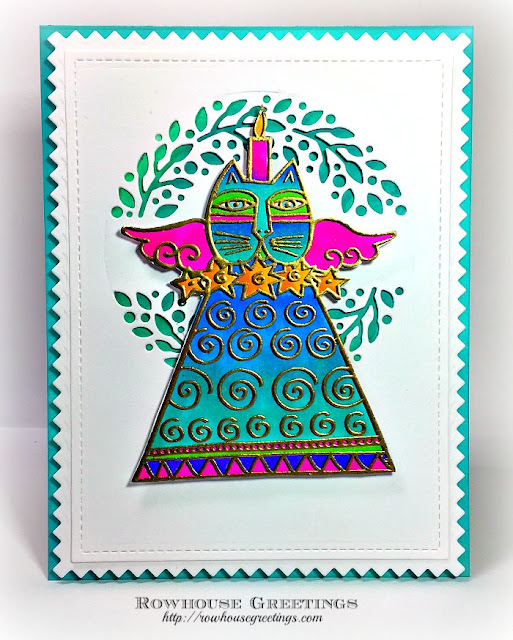 Tips: If using scrapbook paper, a design with a long vertical pattern is a great choice! If dies are unavailable, search for patterns online or trace your own hand and arm, scan and re-size the sketch on a computer and print it at 11” or whatever size you prefer! 2. Use stickers and gems to create a ring and a bracelet. Options: Instead of stickers, stamp and color or stencil on jewelry motifs, or use lace or trim or other embellishments. 3. Add the heart(s), stamped bird or word(s). Use die cuts, create ransom note-style words, use alphabet stickers. 4. Pierce a small hole in the index finger, add metallic braid or twine for a hanging loop. Today’s tutorial combines Tim Holtz’s Crazy Birds with ‘You Got This’ from RubberMoon, a stamp that is always within reach on my work table. 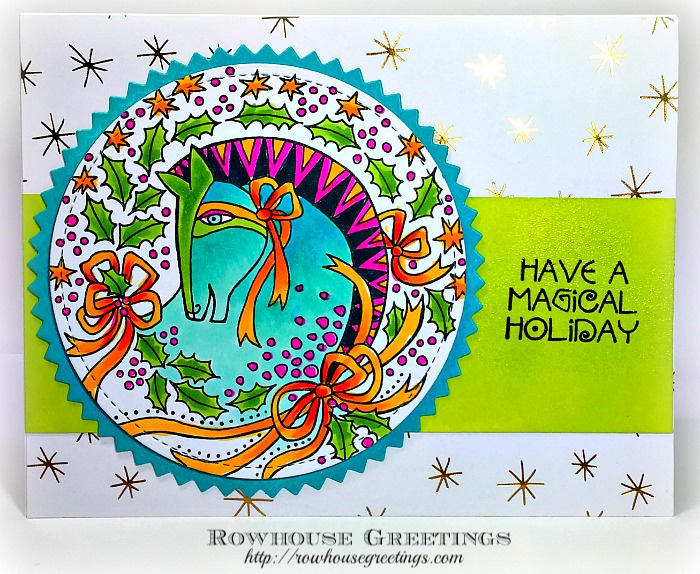 Simple cards with an upbeat message are one of my favorites to make and send. As you can see from the photo gallery, I left a narrow halo around the sentiment when I fussy cut around it and the birds have been hand cut, also leaving a narrow halo (I don’t yet have the matching die set). I snipped off the birds’ (stamped) tails so I could replace them with feathers pulled from a yard sale boa! Solid color cardstock, patterned paper and pieces of washi tape round things out. For all cards, the birds stand on some kind of ‘ground’ – tape, a rectangle, torn paper. The cards vary in size and shape, ranging from A2 to 4.5” x 9”. The sample with only one bird is an ATC (2.5” x 3.5” Artist Trading Card), not a full-size card. It uses the same background as the card with three birds, giving you a sense of scale. Get out some stencils and paint and create unique backgrounds to mix and match and layer. I love sparkling cider for two reasons: It tastes terrific and the neck of the bottle is wrapped with wonderful foil that is gold on one side and silver on the other. (Yes, I admit it – I save the foil from cider bottles…what can I say?) Right from the get-go they reminded me of skirts and I knew at some point I’d use them for dolls of some sort. One morning I decided it was time to make some angel ornaments and the results are shown above. Since no two people have the same scraps and embellishments, use my samples to kick-start your own unique creations. Safety First: Keep these angels out of the reach of small children and pets! They are decorative only, not meant to be toys. 1. One of the angels has a button set atop her head at an angle to create what the Brits call a ‘fascinator’ (hat). The other two have acorn cap hats. Create halos instead (or in addition) if you want traditional angels. 2. Wings don’t have to be realistic! One angel has gathered ribbon and paper for her wings, one has butterfly wings, the third has short pieces cut from a castoff woven placemat for hers. 3. Foil skirts have ‘hems’ where the color from the reverse side is visible on the front. 4. As a focal element, center a large wired cord bow or oversized gem on the chest of the angel. Use tapes and glue that are formulated for whatever you want to adhere. My go-to is Tombow Xtreme Adhesive Tabs. I also did a tad of sewing to gather the ribbon and used double-sided tape to hold the skirts and woven dress in place. Add ribbon or twine or cord if you want the angels to hang from tree or on a wall. Alternatively, let the angels lean among greenery on a mantel or against an easel-backed photo. Another option – Use the angels for party favor/place cards. Add a small name tag and place an angel at each person’s plate. I devoted a recent blog post to stamp carving and printing onto envelopes. 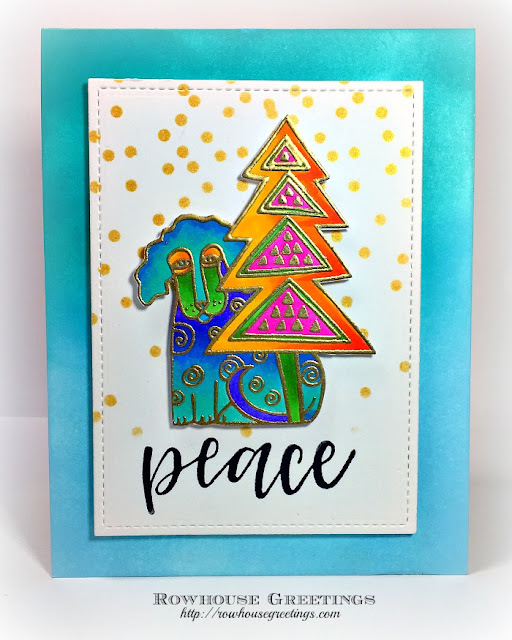 This time I’m going to show how to use that same carved rubber block in a very different way: Instead of simply stamping and coloring, it’s time to stamp, cut and paste and combine, scan or photocopy, re-size, and color! It’s so much fun and the possibilities are endless. 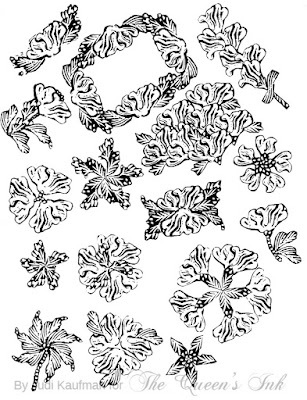 You’re welcome to print a copy of my flower and carve your own version of it for your personal use, or create your own unique stamp block. As shown, the carved stamp measures a mere .75” x 2.75”. Though my projects are predicated on flowers and leaves, yours does not have to stick with the same theme. The key is to see in a new way, to find surprises by cutting something up and reassembling the pieces! This could be done with a whimsical animal, a plant, or anything else that has multiple elements within the whole. Please do not use a commercial rubber stamp for this project because copyright rules prohibit electronic reproduction (unless you own the copyright). By using your own original carved stamp, or mine with the permission I’ve given for personal use, that is not an issue. Alternatively, choose something that is offered as copyright-free. If you are new to carving, a quick Internet search will offer many stamp carving tutorials, classes, and books to consider. 1. Stamp the block dozens of times on thin paper. I chose off-white newsprint to show the process more clearly, but would recommend plain white copier paper. 2. 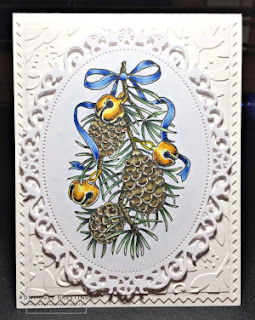 Cut the stamped images into small sections and glue the pieces together to create individual flowers, flower clusters, frames, or whatever you want. A glue stick is perfect for this step. All of my new creations fit onto one piece of paper measuring 8.5” x 11”. 3. Scan the page and adjust the contrast so you have strong black on white images as shown in the photo below (printed on 8.5” x 11” computer paper). Option: If you do not have a scanner, go to a local copy center for steps 3 and 4. Contrast can be adjusted on a photocopy machine; images can also be easily re-sized. 4. Crop and enlarge sections of the scanned images so that when you print them they will be big and easy to color as shown in the photo below. Sizes range from about 2” to 6”. I printed onto lightweight cardstock and colored and doodled with my favorite markers and pens (see supply list). Choose traditional colored pencils, pastel pencils, watercolor pencils, watercolors or acrylic paint if you prefer. TIP: Though it is a bit more challenging to fussy-cut thicker paper, if you are using wet media you will need to print onto watercolor paper or heavier cardstock. 5. Cut out the flowers, leaves and frames that you’ve colored and use them for cards, calendars, art journals, or other projects. Alternatively, instead of fussy-cutting leave them within a rectangle, square, oval, or circle and color the background. 6. As you can see, I stuck to cards and fussy-cut all of the focal images. The samples above and the ones that follow will give you some ideas. Mix in patterned papers, sentiments (peel-offs and die cuts), ribbon and beads, gems, or whatever else suits your project. I die cut the words Hello and Friends from adhesive backed velvet sheets for a tactile touch. 7. Pick the appropriate adhesives: Use paper glue to secure the paper layers in your cards and gem glue to secure the flat-back gems. My cards range in size from 5” x 7” to 8” x 8”. Size your projects as you prefer. Use foam tape if you want added dimension. I love covering and decorating tins. Recently, a friend who knows about this hobby of mine surprised me with half a dozen SUCRETS brand cough drop boxes. The lettering on the lid is raised, making it more difficult to camouflage the words, but I figured out a way around the problem: Turn the word into SECRETS! Cover the letter U with a narrow blue rectangle, adhered with glue formulated for non-porous surfaces (the tin). Options for the letter E: Use a white sticker. Draw on the blue rectangle with a white opaque ink pen, hand- or die cut a simple sans serif E.
Cover the bottom of the tin with a piece of Shimmer Sheetz (lightly sanded/flat or altered with alcohol inks). There it was, tucked among the Halloween stamps: A block I’d carved about a decade ago! It had always been kept in the drawer with the rest of my flower stamps, but it had somehow decided to move. I took it as an omen that the block wanted to come out and play and I decided it must have asked a ghost to carry it to the spot where I would find it. Originally, I had used the stamp as an accent at the top of writing paper and note cards. But this time I decide to whip up a batch of envelopes, the perfect project for experimenting with a small hand-carved image measuring a mere .75” x 2.75”. The black ink pad was already handy from Halloween cardmaking; I picked out three inks in fall colors, envelopes in two sizes, and added my go-to Winsor & Newton ProMarkers to the mix of supplies on my work table. *Buy an inexpensive bench hook to ensure that you will never cut your hand! This simple tool will hold the block in place while you carve, allowing you to use your non-dominant hand to hold the block so it is positioned against the back of the bench hook, and your dominant hand to carve in a forward motion (away from your body and away from the other hand). *Allow the stamp to retain evidence of the human hand at work. 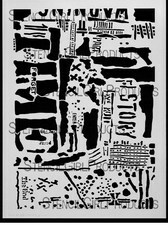 Unlike commercial rubber stamps with perfect lines hand-carved blocks are imperfect; therein the beauty of them is revealed. *Tools needed for carving rubber blocks or erasers don’t have to be pricey. It is only when you get into carving wood blocks instead of rubber that you’ll want finer quality tools and a stone for sharpening them. 1. Use the photos for inspiration. 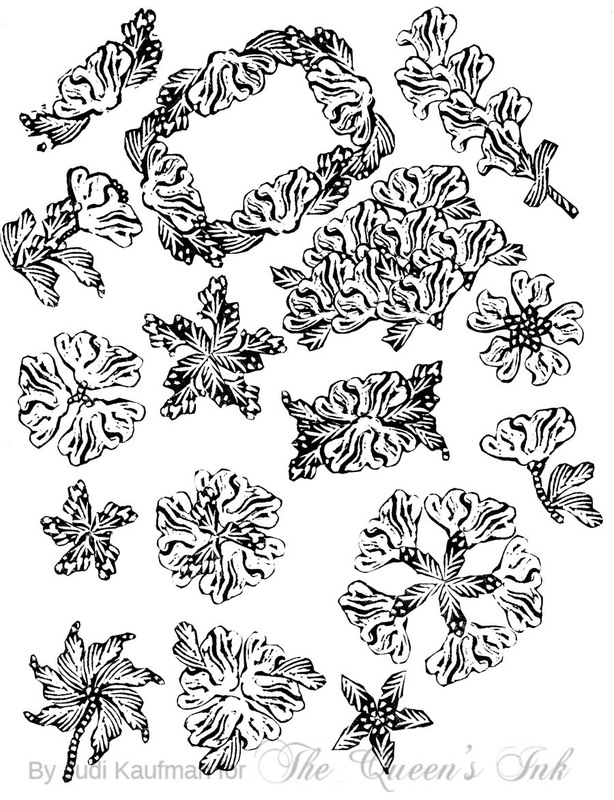 Stamp a small hand-carved flower repeatedly to create frames and borders on a series of envelopes. Choose black or another dark color for the stamping. 2. Use an artist’s sponge to smudge inks on, around, and between the stamped flowers. 3. Use markers to color in and/or around the stamped flowers. Don’t worry about being precise. Hand-carved stamps and free-wheeling random coloring are a good combination. 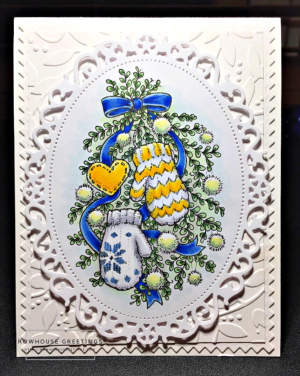 If you don’t want to carve a stamp, substitute a commercial stamp with a similar shape and size – small enough to repeat on an envelope to create frames and borders. If you’re careful, stamps carved from soft blocks last a very long time – mine is evidence of that fact – but for an even more durable stamp, carve wood or linoleum instead of a soft carving block. Whip up some matching writing paper or note cards to use with the envelopes. A set makes a great holiday gift. If possible, buy postage stamps that coordinate with your color palette. Or create custom postage stamps to match! They cost more than standard postage, but it can be worth the splurge.